While several studies have examined the effect of renewable portfolio standard laws on renewable generation in states, previous literature has not assessed the potential for spatial dependence in these policies. Using recent spatial panel methods, this paper estimates a number of econometric models to examine the impact of RPS policies when spatial autocorrelation is taken into account. Consistent with previous literature, we find that RPS laws do not have a significant impact on renewable generation within a state. However, we find evidence that state RPS laws have a significant positive impact on the share of renewable generation in the NERC region as a whole. These findings provide evidence that electricity markets are efficiently finding the lowest-cost locations to serve renewable load in states with more stringent RPS laws. In addition, our results suggest that RPS laws may be more effective tools for environmental policy than for economic development. 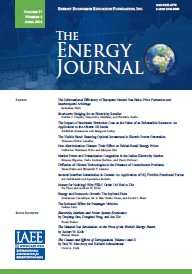 Published in Volume 38, Number 3 of The Quarterly Journal of the IAEE's Energy Economics Education Foundation.